Ever since we found out we're having a little girl, all I can think about is how I'm going to decorate her nursery. 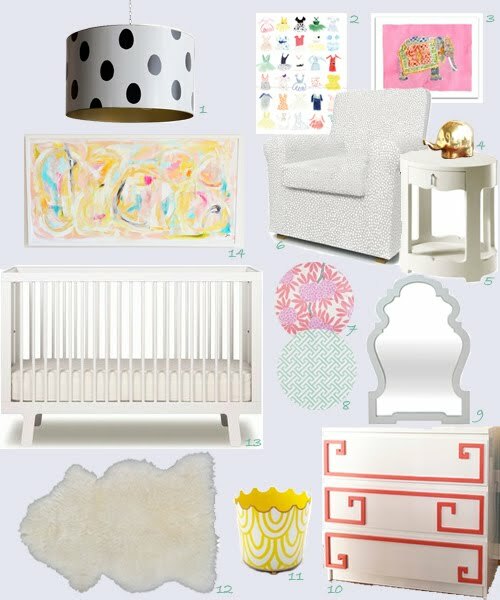 I'm really excited about creating a sophisticated-yet-whimsical space for her. At first, I was very indecisive and had a ton of ideas floating around in my head, but now I think I have a clearer picture of what I want to achieve. I figured if I created a design board with all of the items I bookmarked (along with pieces we already own), then I would know whether or not they will all go together. So far I think I'm on the right track, although I suppose since I still have awhiles to go I might change my mind about a few things. Actually, I'm thinking at this moment that the mirror might change since I can't decide between a modern mirror, a vintage gold one, or a vintage Venetian mirror. A vintage gold mirror would add some warmth, glitz, and history to the room while a vintage Venetian mirror would add history and femininity. Ahh, the choices one must make. I think in the end it'll all come down to the price, so we'll see how my search for the perfect mirror goes. And there will need to be more accessories and storage pieces in the room, but for now, I'm starting out with the basics. How'd I do so far? Whoops, looks like my husband was logged in as me!